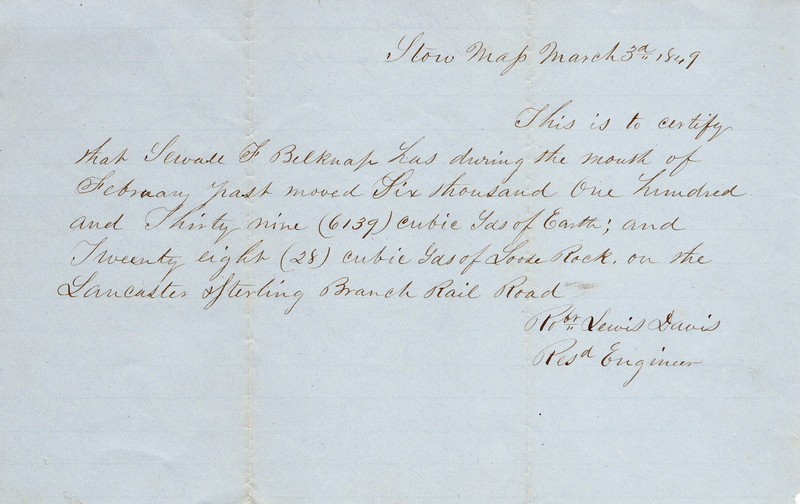 A note certifying the work of Sewall F. Belknap during the month of February 1849 written by Robert Lewis Davis, Resident Engineer for the Railroad. Work done included moving 6,139 cubic yards of earth; and, moving 28 cubic yards of loose rock on the Lancaster Sterling Branch Rail Road. The note is dated March 3, 1849. Paper, 5 x 8 in. 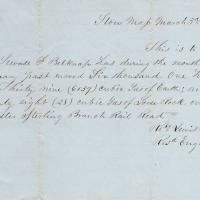 “Document from R. L. Davis - 1849,” Maynard Historical Society Archives, accessed April 23, 2019, http://collection.maynardhistory.org/items/show/6589.